Traditionally this is a spring recipe, made only with fresh peas. I must admit the majority of our peas get eaten raw, straight from the pod! But as most of us have frozen peas to hand all year round, I don't see why we have to limit the deliciousness! Heat the olive oil in a medium sauce pan, then add the rice and cook, stirring, until the rice is fragrant and slightly toasted. Pour in 3 cups of cold water and add the bouillon base. Bring to a boil, then reduce to the heat to a simmer, with the lid on and slightly askew. After about 7 minutes, add the peas and stir well. Raise the heat to bring the water back to a boil, then reduce to a simmer again and finish cooking, with the lid on and slightly askew, another 7-10 minutes. The rice should be soft but not mushy. There should still be some liquid in the pan. 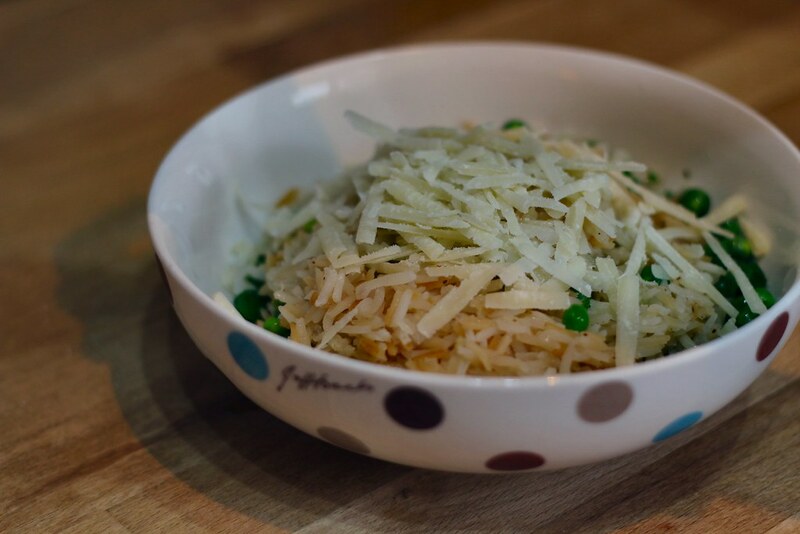 Ladle the mixture into bowls and top with freshly grated Parmesan. Serve immediately.